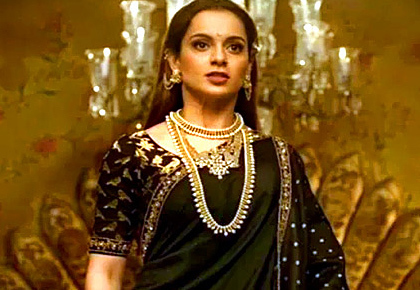 Rediff.com » Movies » Manikarnika Review: Thank you, Kangana! Manikarnika Review: Thank you, Kangana! Manikarnika: The Queen Of Jhansi is one long action scene, notes A Ganesh Nadar. Khoob ladi mardani who toh Jhansi wali rani thi. The poem we learnt in school has been ringing in my ears for over five decades. The Rani of Jhansi has always evoked awe in students who read her story and marveled at the young queen's bravery. She fought against all odds despite knowing that she would ultimately lose. More than winning a battle, she seemed determined to ignite a movement that would end only with Independence. Manikarnika: The Queen Of Jhansi is about the valour of the historic queen, and it goes about establishing that in no uncertain terms. It is one long action scene with patriotic dialogues thrown in. The film is as grand as the Baahubali movies. Unsurprisingly, as both films have been written by the same writer, K V Vijayendra Prasad. The soundtrack -- never overpowering -- matches the 19th century as well. The songs are good as is the choreography. Kangana Ranaut plays Manikarnika very well. Kulbhushan Kharbanda is a shadow of himself while Danny Denzongpa does well in a role reminiscent of Kattappa. Amitabh Bachchan plays the film's narrator. His voice can be so mesmerising that sometimes we listen to it without paying attention to the words. Jisshu Sengupta, playing Manikarnika's husband Raja Gangadhar Rao, does remarkably well. His deep silence when tragedy befalls his child is done so well that it overshadows the shrieking rani. The way he swallows his pride when dealing with the British is also done very well. When the British ruled India, it was said that the two mightiest armies in the country belonged to the Scindias and the Nizam of Hyderabad. They were the richest states of that time. So learning that the Scindia of that period was a coward is quite a revelation. The Karni Sena has not protested, but I feel Jyotiraditya Scindia and his aunts Vasundhara Raje and Yashodhara Raje should have made a token protest at least. Prasoon Joshi's dialogues are meant to make you feel patriotic and they do. The direction concentrates on the queen and everyone else is a prop. I have visited the place the Rani of Jhansi was born in Varanasi and the place where she fell in Gwalior. I have always wondered about her. Thank you, Kangana, for bringing that image alive.